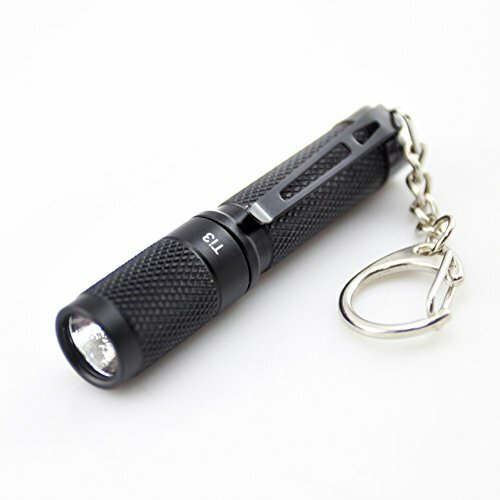 If you are going to have a flashlight on your keychain, you already know that a flashlight that is with you all of the time is an invaluable tool. The best keychain flashlight is a relative term – it really matters where you keep your keys and how much room you think you can take up with a flashlight. Since keychain flashlights are usually really small, they are not as powerful as some other every day carry (EDC) flashlights. With that said most flashlight manufacturers produce some sort of a keychain light. The two main varieties that you will find are the super small micro lights that run off of a watch battery and lights that run on a single AAA battery. There are keychain flashlights that use other battery types like AA or CR123A, but they get a little wider than most want to keep on their keys. 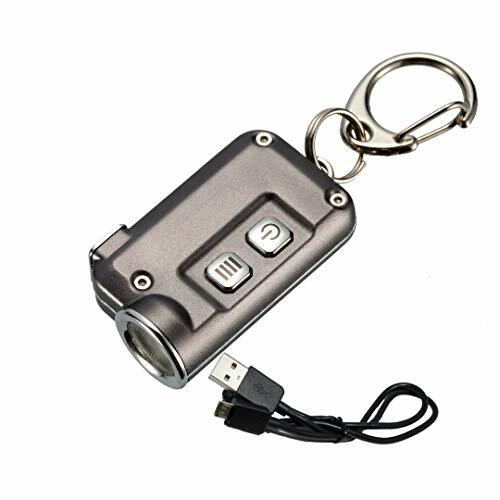 A keychain flashlight needs to be very durable and reliable. If we have the added luxury of high lumens in a flashlight, it is nice, but the most important things are size, durability and reliability. 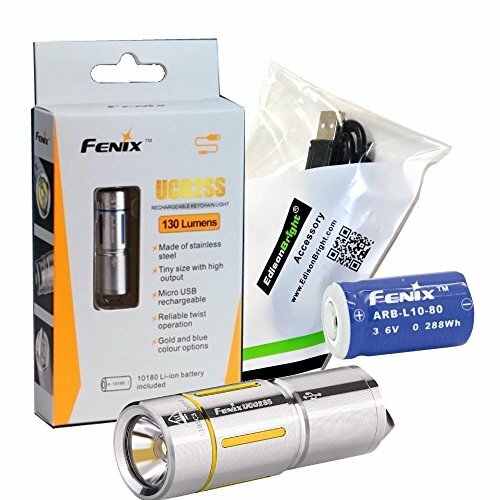 The Fenix UCO2SS is an excellent choice for anybody looking for a keychain flashlight that can also be worn with a lanyard. The Fenix UCO2SS measures only 1.7 inches long and weighs a mere 0.65 ounces. The small flashlight is powered by a single 10180 Li-ion battery that is both rechargeable and replaceable. The battery can be recharged by unscrewing the light head from the body and plugging the Micro USB cable into any compatible power source. Charging takes about 45 minutes to complete. Using a CREE XP-G2 S2 white LED that offers a 50,000-hour lifespan the Fenix UCO2SS offers two lighting modes. The lowest mode will emit 10 lumens of light for a period of 25 hours. The highest setting produces 130 lumens for a period of 3 hours and 50 minutes. On the highest setting, the small light can provide light up to 158 feet with a peak beam intensity of 570 candelas. The two output modes are accessed by simply twisting the head of the light. The Fenix UCO2SS offers an IP68 rating which states that the light is waterproof up to 2m, as well as dust proof. The light is easy to use, reliable and offers impact resistance up to 1m. Powered by a built-in rechargeable Li-ion battery the Olight I1R EOS is made from a strong aluminum alloy for increased durability. The light offers a built-in micro USB charging port that can be accessed by removing the lens housing. Plug the included Micro-USB charging cable into a compatible power source to recharge the battery. Recharging takes 1 hour and 15 minutes and is indicated by a red light; a solid green light indicates charging has been completed. The Olight I1R EOS offers a small and lightweight design that makes it ideal for attaching to keychains or lanyards. One of the biggest selling points is the light is shorter than an AAA battery and slimmer than most pinky fingers and weighs 0.42 ounces including the battery. The Olight I1R EOS offers dual output; a minimum of 5 lumens and a maximum of 130 lumens. Using a high-performance Philips Luxeon TX LED with a TIR optic lens the I1R EOS produces a soft and balanced beam. Output modes can be switched by simply twisting the head of the light. With an IPX8 rating, the Olight I1R EOS can be fully submerged up to 2m for 30 minutes without suffering from any kind of permanent damage. Flashlights that use AAA batteries are much bigger than the button cell flashlights above, but they have a much higher output. Since you have a higher output you are going to go through batteries much faster. If you want to invest a little into having the best rechargeable batteries the Eneloop AAA Ni-MH fit the bill. Our favorite charger for the Eneloops is the La Crosse BC-700 since it easy to use, high quality, and works for both AA and AAA batteries. For non-rechargeable batteries the Energizer L92 Lithium batteries are superior, they are lithium and not alkaline so they have more charge and a longer shelf life. As part of the Executive Series the Maratac Copper Rev 4 offers the long awaited medium/low/high settings order that thousands of users have requested. Most users find that they often use the light on the medium setting rather than high or low, so it makes more sense to have the light power up in the most used mode. The body of the light is manufactured from an ultra conductive C360 Free Machining Brass. The light is packed within foil packs to help protect and preserve the hand finished light. With the Maratac Copper Rev 4 users have the option of the three brightness levels with the highest setting offering 15 lumens and the lowest setting 1.5 lumens. Using a Nichia 219C LED with a 50,000 hour life span, the Maratac Copper Rev 4 offers the newest and brightest emitter available. The new emitter also offers the same ultra-low thermal resistance that the CREE emitters have to offer. The AR coated lens is paired with an aluminum alloy orange peel reflector to provide a smooth, steady beam of light. Powered by an ordinary AAA battery the light can run from 55 hours on its lowest setting. As ordinary alkaline batteries have a higher risk of leaking the manufacturer strongly recommends using a rechargeable battery instead. 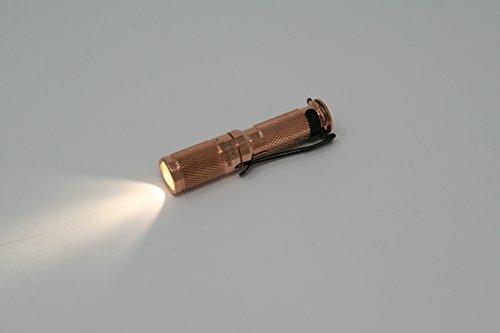 A great light that would be a great survival flashlight option. Originally launched on Kickstarter this Prometheus Beta QRv2 is not a cheap copycat version. One thing worth noting is that the Prometheus Beta QRv2 is not backwards compatible with the original Beta QR because the QRv2 requires a very specific groove design in order to work properly. With the Beta QRv2 you get all the same core qualities of the original design, such as the design, superior beam quality, and the aesthetic appeal, plus so much more. Designed to be the best keychain flashlight that works when you need it to the Prometheus Beta QRv2 doesn’t disappoint. One of the newest features to be added to the Beta QRv2 is push and pull design to engage and disengage the light. The light features 10 pounds attach and detach force with a snag-free brass component that makes accidentally detachment pretty much impossible. Every time you attach the light back onto the retaining clip you will hear it click into place. The flat split rings are now manufactured from stainless steel to improve their durability. Powered by a single AA battery the manufacturer strongly discourages the use of ordinary alkaline batteries as they release a corrosive gas. The manufacturer recommends Lithium or NiMH batteries only. The Beta QRv2 uses a Nichia 219B High CRI 4500K LED to provide a maximum of 60 lumens. The light offers two output modes and is controlled with a twist on and twist off interface. A great light to keep around and with the inovative quick release it might even be a good backup to a bigger light or a pistol light. If you are in need of a powerful light that will easily fit onto our keychain take a close look at the Thrunite Ti3. Despite its small size the Thrunite Ti3 is one of the brightest keychain lights at an affordable price. Using a CREE XP-G2 R5 with a lifespan of over 20 years you can rest assured that the Ti3 is built to last. This version offers a Natural White light, but users can also order a Cool White light. Manufactured from aircraft grade aluminum the light features an anti-abrasive finish to improve durability. One of the greatest selling points with the Ti3 is how simple it is to use. The small light allows for easy one handed operation with a twist switch design. Powered by a single AAA battery the light offers four brightness modes, which is not something commonly found in keychain lights. The light offers Firefly, high, low, and strobe mode making it an excellent choice for an EDC style of light and a favorite of the EDC Community. Maximum output for the Ti3 is 120 lumens for minutes. The light offers a removable pocket clip and a key ring for a choice of carrying options. If you are looking for the best rechargeable keychain flashlight look no further then the Manker LAD. One of the things that makes this the best is its unique design. The Manker LED offers a flat design rather than a round design allowing for a batter and more comfortable fit inside pockets or on keychains. Even better is the light is only 2 inches long allowing it to blend in perfectly with your keys. Made from aluminum alloy the Manker LAD features a built-in polymer lithium battery. This rechargeable battery can be fully recharged in 70 minutes with any USB charging device. The switch button of the Manker LAD also doubles as a charging indicator. 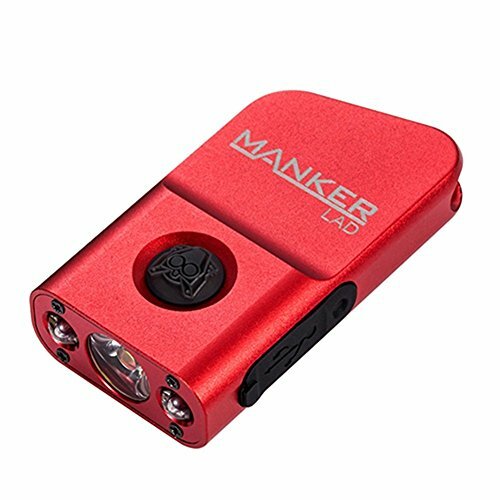 When the light needs to be recharged users will notice the Manker LAD will automatically switch to the Red LED setting. Flashing blue indicates fast charging while steady blue indicates trickle charge to protect from overcharging the battery. The Manker LAD uses a Nichia 219C LED with a high CRI number. This emitter allows for a maximum of 230 lumens for up to 30 minutes. The Manker LAD also features a 2x Red Straw Hat LED that has the ability to emit 1 LED of red light for up to 100 hours. The Nichia 219C LED offers users the choice between three brightness levels and an additional strobe mode. Belonging to the T series of flashlights the Nitecore TINI is a Mini Metallic Micro-USB Rechargeable Keychain Light. 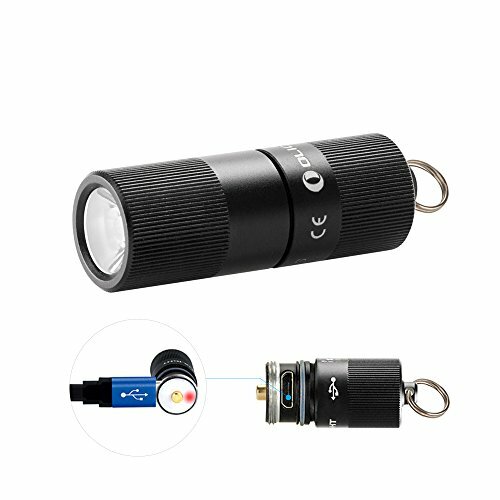 Measuring only 1.7 inches long the light has the ability to easily fit onto most keychains without getting in the way as it is about the same length as most keys. The compact and lightweight design allow for you to always have a flashlight when you need it. The size and design make the TINI a perfect choice for an EDC light. The Nitecore TINI features a powerful CREE XP-G2 S3 LED that offers users a beam of light with a 70 yard throw. The emitter has the ability to produce a maximum of 380 lumens in Turbo mode. Users have the choice between four brightness levels giving them the ability to choose the right amount of light for the situation they are in. The built-in Li-ion battery is easily recharged using a variety of power sources. Simply remove the cover to the charging port and plug in the included charging adapter. The Nitecore TINI features an indicator light that will alert you to battery levels and provide you with the charging status. To access the battery indicator light simply tap on the operating switches when the light is off. Both lights will blink to indicate current power levels. A blue light under the control buttons indicate charging status, blinking means charging and steady means done. 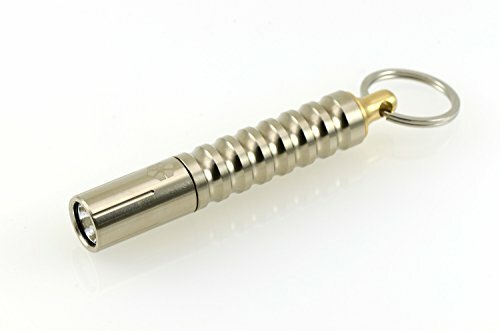 I hope that this has helped you find the best keychain flashlight for your needs. If you like any of the flashlights that you see in this article or in any of our other articles, please click one of the Buy Now buttons to make your purchase on Amazon. As an Amazon affiliate we make a small commission off any purchase made from a click through from our website, which is how we are able to provide you with these amazing informative articles. Clicking through from our website will not cause you to pay more on Amazon, as the price is the same if you go to Amazon directly – the difference is the commission that we receive. Please take a look at our other Best Flashlight articles. If you are new to flashlights and are not sure about some of the lingo here please visit our flashlight buyers guide.